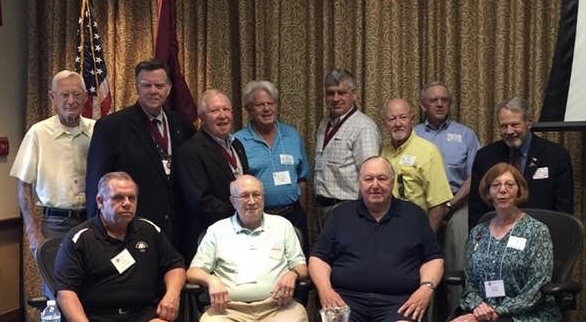 Company Governors Assemble at 2018 Meeting. Governor Scarlet Gathings Shepherd is in white at left center. 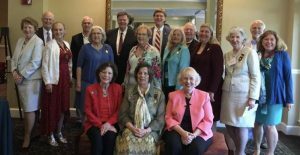 The 2018 Jamestowne Society National Conference was held May 10 – 12, 2018, at the Kingsmill Resort in Williamsburg. This was a new venue for our Society functions as we previously met at the Williamsburg Lodge in Williamsburg. This resort is in a gated community and is a golf resort. 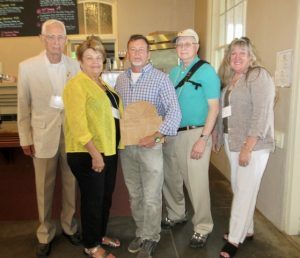 Thursday, May 10 there was a Wine and Cheese event hosted for company governors and one guest per governor at the Dale House Cafe and Archearium on Jamestown Island for guests to mingle with one another as well as with archaeologists and national Society Council members. David Givens, senior staff archaeologist, showed a plaque of wood, which will be used for the pews in the restored church. He explained that when he was in England, he measured pews in several old churches, taking into consideration that the average Englishman in yesteryear would have been smaller. There were many such discussions amongst the guests and everyone was delighted to see Dr. Kelso and have him sign his book, Kingsmill Plantations, which was gifted to all attendees at the conference by Jamestowne Society. The governors’ business meeting was held at the resort on Friday, May 11. 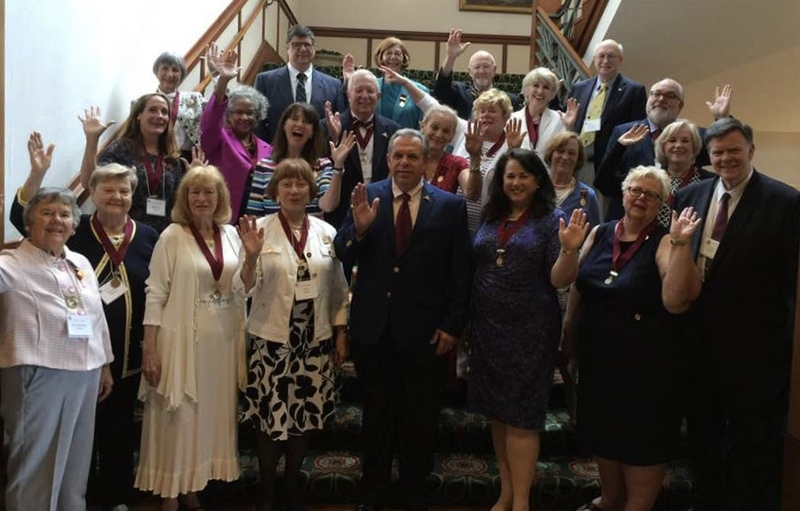 Seven of our elected national officers, six Regional Directors and thirty-six of the fifty-three companies from across the country were represented. Past Governor Jerry Zillion introduced the Jamestowne Society military veterans who were present at the meeting. Besides being provided important leadership information, there were break out group discussions led by Regional Directors. Our Western Regional Director is Jane “Xan” Alexander. Later there was a chance for input or questions for the entire group. Some of the items discussed were to start the membership process, their Society sponsor (a member) would contact Bonnie Hofmeyer to ask that an invitation be sent to a prospective member. However, Bonnie recommends that the invitation not be requested until the prospective member has their papers in order. As always, the one-year limit exists and if the application is not sent in within the year, there will be a penalty assessed. The only exception to the rule is if the Society has made an error. Unofficially, many Governors have their membership chairs assist prospective members with their papers. Please note: only the 4th edition of Adventurers of Purse and Person are now accepted and these are not normally found in libraries. The Society has confirmed over 900 names of individuals who meet its 17th century ancestry criteria and are listed among its Qualifying Ancestors. On the Society’s Home page, click on the link for the Revolutionary War Era couples to Jamestowne Society Qualifying Ancestor project list, last updated May 2017. Please send upcoming company events to Jamestowne.society@verizon.net for posting on the Company event webpage at www.jamestowne.org. Also, please refer members and prospective members to the website to keep up with future happenings. During the business meeting, there was a discussion about the Annual Giving Campaign and where the money goes. Preservation Virginia, which is a non-profit organization was mentioned as needing funds as well as Jamestown Rediscovery. Everyone was given the same handout that we all were mailed. As this is aimed at individual members, Jim and I have chosen and donated $100.00 to the Harrison Ruffin Tyler unrestricted fund. From discussions, we learned that the unrestricted funds are easier to manage meeting the needs of various current and future projects. The Reverend Roy Abbott Martin Jr, Governor of Jamestowne Society, encouraged members to get involved by filling out volunteer forms, indicating their talents and interests. Check the Magazine for the committee chairs and send your email to the Society. Mary Anna Richardson, Lead Archaeologist Jamestown Church- Jamestown Rediscovery gave a special talk re her recent activities. After the business meeting, there was a buffet luncheon with Dr. William Kelso, followed by his presentation and a walking tour of the three sites. Buses were available for those who needed transportation. 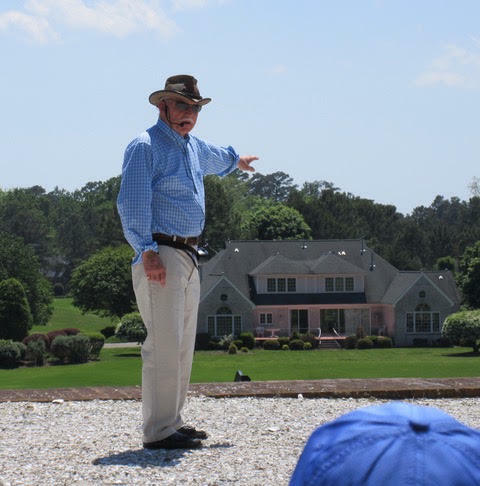 Before construction began on the Kingsmill Resort, Dr. Kelso, working for the Virginia Historical Landmark Commission, partnered with Anheuser Busch to conduct fieldwork on this site. The Governors’ Dinner was also held on Friday May 11. Governor Martin recognized Jim Shepherd (my husband and Historian of First California Company) as the Registrar who had helped him with his application papers for the Virginia Branch of the Huguenot Society of the Founders of Manakin in the Colony of Virginia. We were honored when he and his wife chose to sit at our table. Bonnie Hofmeyer, Executive Director and also Dr. John Shelton, Secretary of the Treasury greeted Jim warmly as he had also helped them with their papers for the Virginia Branch of the HSFMCV. Saturday May 12 was the Spring Membership Meeting and Luncheon. Merry Outlaw, Curator of Collections Jamestown Rediscovery, was the guest speaker and had interesting slide shows to accompany her talk. Next year will be the 400th Anniversary of the First General Assembly held at Jamestown. 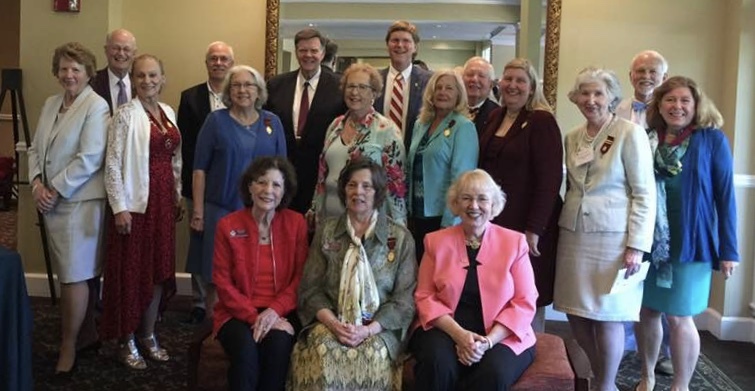 Instead of our annual Jamestowne Society meetings being held in May, they will be held July 27- 30, 2019. All indications this will be a special celebration, so please plan on attending. 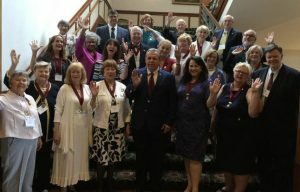 This entry was posted in 2018 Governors' Forum, First California Compoany, Gotlieb, Historic Jamestown, Jamestowne Society, Jamestowne Society Governor, Jim Shepherd, Kelso, Membership, Scarlett Gathings Shepherd and tagged 2018 JS Spring Meetings. Bookmark the permalink.